This well-documented work by Maggie Laubser (plate 15) is signed and dated 1925, and forms part of what is referred to as her ‘Oortmanspost phase’, which lasted from c.1924 to 1928. This period commenced with her return to South Africa in November of 1924 from the cosmopolitan artistic circles of Weimar Berlin to a life of seclusion on the farm Oortsmanspost near Klipheuvel, 45-odd kilometres from Cape Town. For Laubser it was a sudden step backwards from a vibrant European culture of formal experiment and free expression, to a hermetic colonial world where time had seemingly stopped and the local art world was mired in conservatism. Her first solo exhibition at the Argus Gallery in Cape Town in early 1925 provoked the outrage of local critics and the ridicule of many, including her associates in the SA Society of Artists, to which she had belonged since 1907. The exhibition was a financial disaster and she retreated to Oortsmanspost to a life of introspection and loneliness. 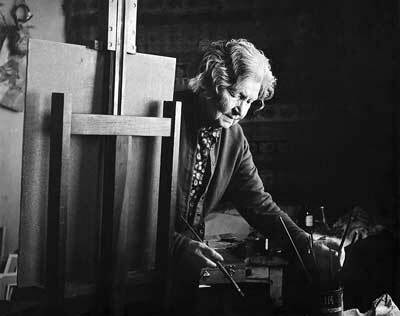 Laubser did not abandon her faith in her artistic ideals, and continued to work, braving the poverty that overwhelmed the farming community during the depression years. She embarked upon an interior journey and a communion with nature and its cycles; this resulting in a body of work that is unique in South African painting. Referring to this period in her old age she stated that ‘everything I know the farm has taught me – not study abroad’.1 Oortsmanspost provided Laubser with many models. This portrait in the Campbell Smith Collection was painted during her first full year there. Now entitled Portrait of a woman, it was previously exhibited on Laubser’s 1969 retrospective at the Iziko SA National Gallery with the now-problematic title Hottentotvrou; later retitled Portrait of a Hottentot woman when it was published in Johann van Rooyen’s monograph on the artist in 1974. Johann van Rooyen. 1974. Maggie Laubser. C. Struik Publishers: Cape Town and Johannesburg, p. 16. Born Malmesbury District, Cape 1886; died Strand, Cape 1973. Training 1903: Brief period of study under Professor Edward Roworth, Cape Town. 1913–1914: Spent a brief period at the artist’s colony at Laren, Holland. 1915: Slade School of Art, University of London. 1922: Went to Germany, studied and painted under Prof Jächels, and was strongly influenced by German Expressionism. Selected Exhibitions 1909: Second Annual Exhibition of the SA Fine Arts Association, Cape Town. 1922: Twenty-first Annual Exhibition of the SA Society of Artists, Cape Town. 1925: Solo exhibition, Argus Gallery, Cape Town. 1937: Art from the Commonwealth, Royal Institute Galleries, London. 1948: South African Art, Tate Gallery, London. 1953: Rhodes Centenary Exhibition: Three Centuries of SA Art, Bulawayo, Southern Rhodesia. 1954: Venice Biennale XXVII with other SA artists. 1963: Maggie Laubser Retrospective exhibition, Egon Guenther Gallery, Johannesburg. 1969: Maggie Laubser Retrospective Exhibition, Iziko SA National Gallery, Cape Town, Pretoria Art Museum and Johannesburg Art Gallery. Collections Iziko SA National Gallery, Cape Town; Johannesburg Art Gallery; Sanlam Art Gallery, Bellville, Cape; Pretoria Art Museum; Nelson Mandela Metropolitan Art Museum, Port Elizabeth; Durban Art Gallery; William Humphreys Art Gallery, Kimberley. Awards 1946: Medal of Honour for Painting awarded by the SA Academy for Arts and Science. 1947: Oscar Award for Painting from Die Vaderland. 1959: Elected an honorary member of the SA Academy for Arts and Science. 1968: Medal of Honour, South African Association of Arts, Western Cape Branch. This portrait (plate 3) is listed as no. 289 in the 1994 catalog raisonné of Laubser’s works, and formerly belonged to a resident in Strand, where the artist lived for many years.1 This former owner held that the work was a portrait of a woman on the farm Oortmanspost, which was owned by Laubser’s family. There may be an assumption that that this work belongs to Laubser’s ‘Oortmanspost phase’ (see ReVisions, p. 64) which began in 1924. In 1920 Laubser returned briefly to South Africa from Europe on the same ship as Irma Stern, whom she met on board. She went back to Europe the following year, so this painting was produced over this brief period at home. This simple and directly-painted portrait is an excellent example of her skills as a colourist. The painting is primarily an essay in colour contrasts of two kinds. There is the use of both light and dark and warm and cold colour contrasts. The most direct warm-cold contrast is between the bright red headscarf and the blue background, which varies from a cold blue on the left to a warmer variation of the colour on the right. Generally, the colours used to articulate the sitter’s face are a medley of warm and cooler browns, with complementary accents of orange and bluish tones highlighting the planes of the cheeks and the bridge of the nose, as well as the lips. Dramatic light and dark contrasts emphasise the form of the headscarf and the head, neck and shoulders. These darker areas are tones of crimson and purple. A contrast of white and coloured whites with variable tones of purplish-blue articulate the simple garment that is worn. Dalene Marais. 1994. Maggie Laubser: her paintings, drawings and graphics, Perskor, Johannesburg, p.142.